October 2008 saw the last of the district’s 140,000 households added to the new collection scheme which encourages everyone to recycle more and do their bit for the environment. The new collections however started with a pilot area in November 2007 when there was a 95% take-up of the new services and recycling targets were easily exceeded for phase one. 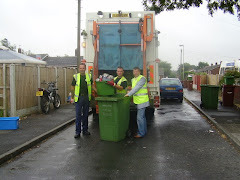 The Council then used its experiences in phase one to start rolling-out the scheme across the rest of the district in three more phases and is now seeing an increase in recycling across the district. The new weekly bin collections are proving a huge success with less rubbish going to landfill and more people thinking about what they do with their waste. The teams have reported an excellent take up on the new service and everyone concerned are absolutely delighted that so many households have got on board with the scheme so quickly and I would personally like to thank everyone for their support. We are working very hard to make the district a more attractive place to live, work and visit and this scheme means everyone has a role to play in making their environment cleaner and greener. The district is on track to meet or exceed the government’s 40% target by 2010 and every household on the normal collection rounds now receives a household waste and garden waste collection one week, and a collection of paper, cardboard, glass bottles, cans and plastic bottles for recycling the next.